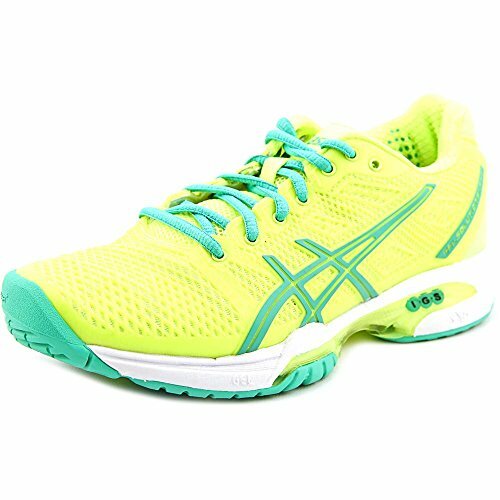 The listing for the top 10 Best Tennis Shoes for Women includes the following tennis shoes that are highly rated through Amazon.com buyers and sellers, and from the listing it is evident that ASICS, K-Swiss, and Nike are the three brands that are consistently rated on a four to five star basis by consumers. The following overviews relate the features and benefits of each of the top 10 selections that are available through Amazon.com. The ASICS GEL-Resolution 5 Tennis Shoes provides superior comfort with little time required for breaking in for simply wearing or playing tennis. They are feather light, roomy, stable and stylish with built-in technologies that allow the foot to perform a more relaxed toe to heal movement. A gel cushioning system for both rear and front foot movement provides limited shock impact with minimal slide and great traction. Playing tennis in an ASICS is worth every minute of the game. They are 100% polyester with a mesh upper, synthetic overlay, DuoMax support system, forefoot GEL cushioning, and an AHAR(Asics High Abrasion Resistant Rubber) outsole. They are available in a wide array of wild and more subdued colors that include Fuchsia/White/Silver, White/Silver, Black/Hot Pink/Silver, Grape/White/Silver, White/Purple/Lavender, and White/Aqua Green/Lightning. Sizing can vary by a half size, so measuring is suggested. 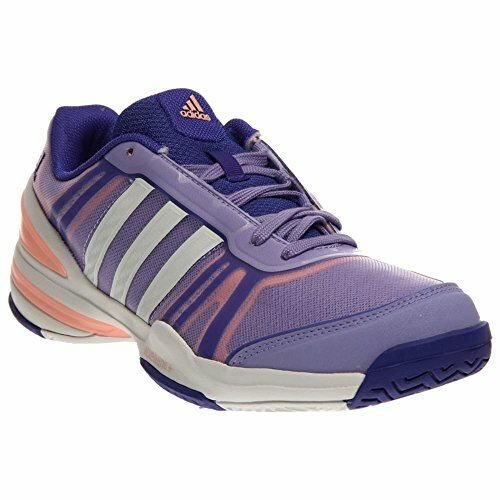 The Adidas Women’s CC Rally Comp Tennis Shoe allows tennis enthusiasts to play the game more quickly because of the way the shoe is assembled, and its super light material composition makes it even more comfortable for play. It is made of synthetic-and-mesh, has a durable rubber sole, with a heel measurement of 1.25 inches and a platform of 1.00 inches. The Climacool mesh upper allows increased ventilation to the feet, and ADITUFF, an abrasion-resistant material, brings stability to the shoes. An internal support system provides increased stability, breathability, and resistance to abrasion. In the midsole area, a TPU Torsion System provides added stabilization with Soft EVA for midsole cushioning. The outsole features ADIWEAR that provides durability on any surface and Adiprene+insert (shock absorbent material) supports and protects the heel and aids in forward motion quickness, without the worry of stumbling or injury. The shoe runs true to size and is offered in a variety of bright and bold colors that include Clear/Pink/White/Light Flash Red, Bold Pink/White/Tribe Berry, Running White/Tribe Purple/Glow Purple, Light Flash Purple/White/Night Flash, and Frost Mint/Black/Vivid Mint. New Balance offers a lightweight, manmade tennis shoe with a hard-wearing rubber sole that has a tough leather upper and textile finish, and is designed to fit. A rugged rubber compound, Ndurance, provides for ultimate outsole durability, and Abzorb (cushioning compound) provides maximum protection and comfort, particularly when playing at fast speeds. Imeva (injection- molded EVA foam) cushions the midsole area and provides added padding, and interior lining, that not only allows for quick movement and flexibility but reduces shock to the legs and the rest of the body. A herringbone outsole tread pattern and Probank (stability technology) bring increased traction, stable side movement and fast pivoting with this flexible tennis shoe. The 696 is great for those with high arches and provides the necessary width in that area of the sneaker. Colors available include White/Pink and White/Silver and newer colors in the line are White/Coral Pink, and Pink/Grey. 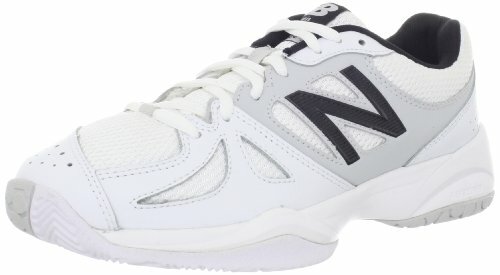 New Balance tennis shoes may run somewhat smaller for sizing purposes, so measuring is suggested. ASICS‘s Gel-Game 4 classic look tennis shoe is lightweight, stylish and broken-in from the day the shoes are taken from the box. In fact, ASICS tennis shoes can accommodate most any foot type from feet that tend to roll inward, to those that go outward, to those that remain in more neutral positions. The lacing of the shoe is traditional, which makes for a true fit. This synthetic, mesh tennis shoe, with a comfy textile lining, has a non-marking rubber outsole, which brings increased support, durability and traction with hard or soft tennis courts. A PGuard Toe Protector provides toe durability and helps evens out body weight for quick movements across the court. The midfoot area is protected by a Midfoot Trusstic System that lessens the weight on the sole, yet the shoe remains stabilized. There is a removable insole that protects and cushions against shock and an EVA midsole for added bounce and cushioning. FluidAxis technology allows for deep flex grooves in the rear of the shoe that aid natural foot movement as well as shoe fit, functionality and flexibility. ASICS offers a number of bold color choices with this shoe that include Titanium/Silver/Electric Melon, Charcoal/Silver/Sharp Green, and White/Fuchsia/Lightning. 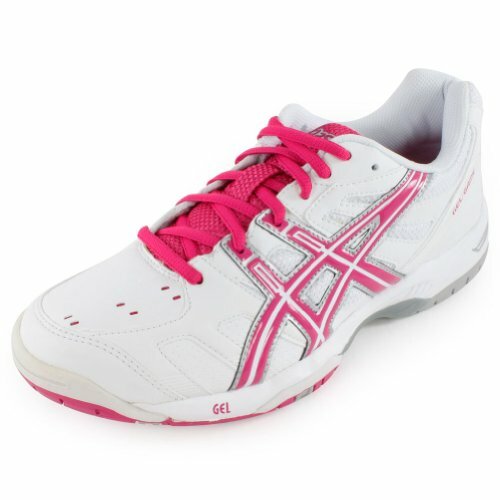 ASICS tennis shoes run true to size, but this particular shoe may run longer, so measuring is suggested. 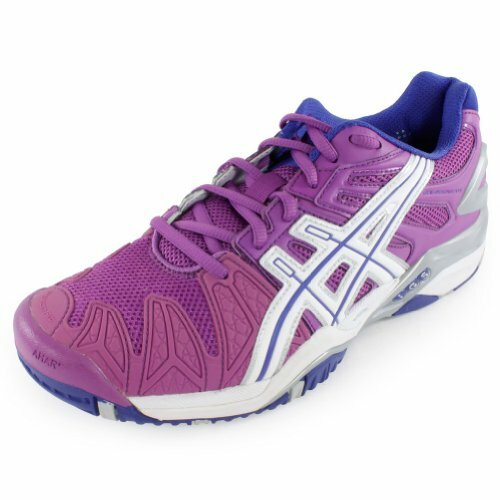 ASICS’s Gel-Solution Speed 2 Tennis Shoe is the second generation of the ASICS Gel-Solution Speed. This newer and top-of-the-line tennis shoe has a synthetic and mesh upper, rubber sole, a memory foam padded tongue and collar, plus the shoe is memory foam-lined with Solyte (extremely light)in the midsole, and there is rear and Forefoot GEL system cushioning for added comfort. 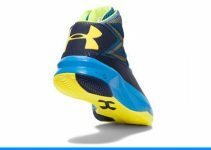 Its full length Flexion Fit Upper design brings great comfort and support for the intense and nimble player. PGuard Toe protector enhances the durability of the shoes for long-term use and performance. The sole portion of the shoe is low profile yet the sides are more flared at the forefront of the shoe for increased stability. Intense play features include midfoot TrussticTM which aids in turning stability, while design for side movement provides quick response and control during play. 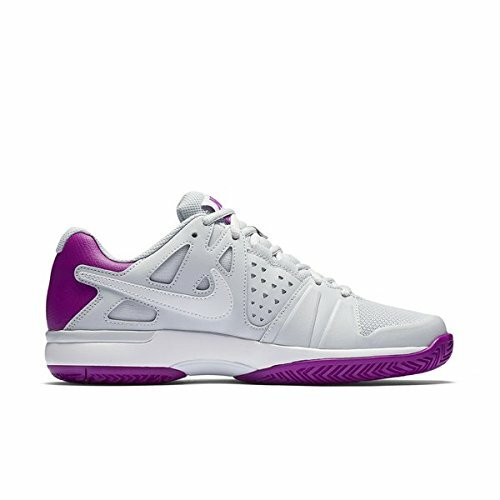 This lightweight and highly rated tennis shoe is available in a color range that includes Hibiscus/Silver/White,Purple/Silver/Lime and Grape/Silver/Sharp Green. Sizing may involve moving up a half size as this particular shoe runs somewhat small, so measuring is suggested. The Nike Zoom Vapor 9.5 Tour Ladies tennis shoe structure incorporates a Dynamic Fit system that allows for a tight yet comfortable fit, along with Nike Zoom unit technology that brings superior cushioning to the entire foot, and the deep flex grooves on the shoe bottom allow for better articulation and movement. The upper part of the shoe has a Textile mesh-look material with understated, yet stylish graphics that provide lightweight ventilation for the feet with a hint of fashion fun. With the Dynamic Fit system, the midfoot and arch are seemingly in-cased or wrapped for a perfect, glove-like fit. From the midfoot to the heel, TPU wraps from the side to bring stability for quick movements and turns. Phylon (midsole, foam-like material) provides for protection and body weight absorption, and the Nike Zoom unit has been added to the heel area for cushioning. The XDR rubber compound strengthens the outsole, and the same compound is used on the heel and forefoot to add traction for multi-surfaces and durability. Footframe is wrapped on the toe area for increased durability and protection. These high performance enhanced (Nike emblem) shoes come in a large number of neon-like colors that include Summit White/Light Bone, White/Metallic Silver-Neutral Gray-Cool Grey, White, Pink/White, Hot Pink/Pink Pow/Black/Volt, Pink Glow/Light Base Grey/White/Atomic Orange, Midnight Fog/Phantom/Vivid Purple, Hyper Punch/White/Dark Ash/Silver Wing, Fuchsia glow/dove grey/hot lava, and Light base grey/urban lilac/atomic ma. For sizing purposes, this shoe is true to fit. K-Swiss’s Bigshot Light Tennis Shoe offers more than a comfortable fit. The padded collar and tongue of the shoe provide just the right snugness mixed with comfort. Its Flow Cool system on the upper part of the shoe allows for ventilation and management of moisture from the heel to the toe, which keeps feet cool, dry and comfortable. A SUPERFOAMA foot bed offers resilience and cushioning that allows superior energy lift to the feet on the tennis court and beyond, and a special Heel Grip Lining with interlocking fibers provides for minimal heel slippage. Even the toe area is protected with a DuraWrap technology that defends against toe dragging, and there is extra room in the box toe area to relieve toe scrunching. The laces on this attractive and tight tennis shoe remain tied and operate as a catch effect to keep the laces in place. 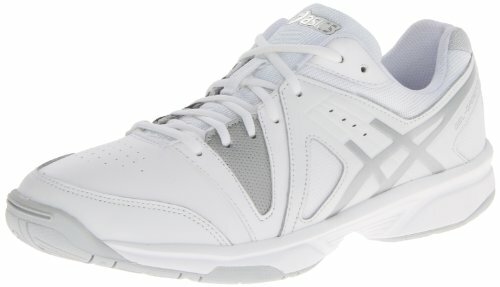 Other superior characteristics of this tennis shoe include a wider foot area that helps to prevent foot roll over and ankle damage, K-EVA for added cushion and shock absorption, a Y-Beam support for the midfoot area, which brings arch anchoring and stability, DragGuard for rear toe and heal abrasion protection, and dense high-abrasion rubber on the outsole that provides superior traction from heel to toe. This K-Swiss tennis shoe offers a lightweight, snug, form-fitting, yet sleek and bold look that is durable and comfortable and brings confidence to the courts. These affordable shoes come in White/Silver, Black/Neon, White/Shocking Pink/, and Red/Vapor, and they usually fit true to size. Nike’s Women’s Air Vapor is another tennis winner for players of all levels. It is lightweight in structure, with little break-in time, and it provides a good fit and responsiveness on the court. It has a mesh upper with synthetic overlays that aid in support and air flow, and its padded collar and tongue provide for a superior and supportive fit, and a mesh lining and cushioned insole bring both comfort and shock absorbing value to the shoe. It has a lengthy yet lightweight Phylon (midsole, foam-like material), along with an Air-Sole heel unit that provides cushioning and high impact protection. A shank (stiffening) at the midfoot level helps with shoe stability, and a rubber compound (XDR) provides excellent traction. 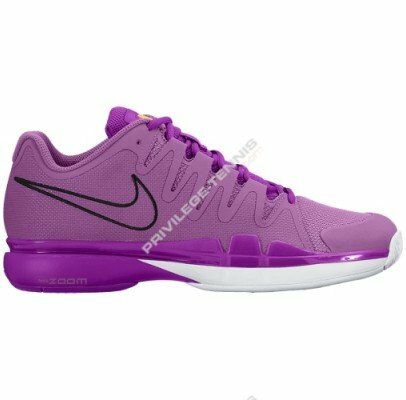 These comfy and more traditional looking tennis shoes sport the traditional Nike emblem and come in both vivid and neutral colors such as Night Silver/Provence, Purple/Vivid Purple, White/Dove Grey/Fuchsia Glow. This shoe is true to size with a slightly wider width and lower arch, so measuring is suggested. 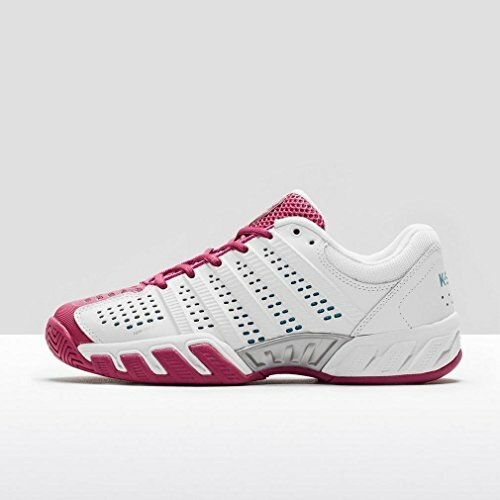 The K-Swiss Hypercourt Express LTR Women’s Tennis Shoe is now designed with a lightweight mid and outsole and has superior traction tailored for tennis use. This tennis shoe is not only trendy, comfortable, bold, well-made and ultra fashionable, it’s also lightweight, supportive and sturdily designed for rugged and quick tennis moves. The body is treated to a shock-absorbing surprise due to the specialized rubber sole and sole padding, with a heel measurement of approximately 1.5 inches, which includes a detailed two piece outsole and EVA cushioning that protects the back, knees and joints from strain and damage. The shoe has a vented vamp and a cushioned collar heel that provide added comfort, stability, and easy maneuvering on an off the tennis court. ASICS’s Gel-Game Point tennis shoe is the entry level, more traditional model, in the Gel line and features a full grain leather upper, foam padded collar and tongue, and other synthetic shoe materials for comfort, cushioning, breathability and stability. It is a lightweight, comfortable and affordable shoe that requires little to no break in time, and fits true to size. The shoe has a solid rubber non-marking outsole with side wraps and an adjusted herringbone tread pattern for both durability and traction, particularly on hard tennis courts. The midsole contains injected-EVA for consistent cushioning, shock absorption and support. The GEL Cushioning System lessens shock during hard play and allows for easy transition to a normal midstance tennis position. The tennis novice loves these shoes for the fact that there is limited slipping and sliding on the court. 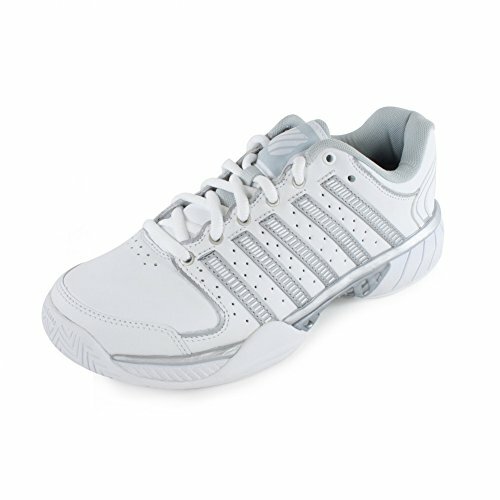 Color combinations for these clean and classic looking tennis shoes include White/Silver/White. They are narrow in the front with low arch support, so measuring is suggested for those with wider feet.